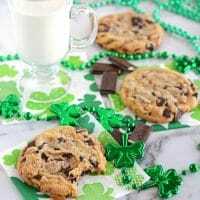 To celebrate St. Patrick’s Day this year I combined two of my childhood favorites into these Andes Mint Chocolate Chip Cookies. I was first introduced to the Andes Mint when my grandparents would take me to Luby’s. That was such a long time ago. I don’t know if they still have them available, but every time I went to Luby’s, I would look forward to the end of the meal when I would get an Andes Mint from the lady pushing the condiments and drink cart. I know those days are long gone. The last time I went they had done away with the cart ladies, and that kind of made me a little sad. It felt like they took a little piece of my childhood away. I think they started charging for the mints as well. Another sad day for me, but they sell these Andes Mints by the box now at your local grocery stores, so at least now I can buy a whole box! To celebrate St. Patrick’s Day the custom is to wear green so you won’t get pinched. But maybe you don’t have anything green in your wardrobe. (Hey, it could happen, maybe it’s not your color.) I don’t think you’ll need it. 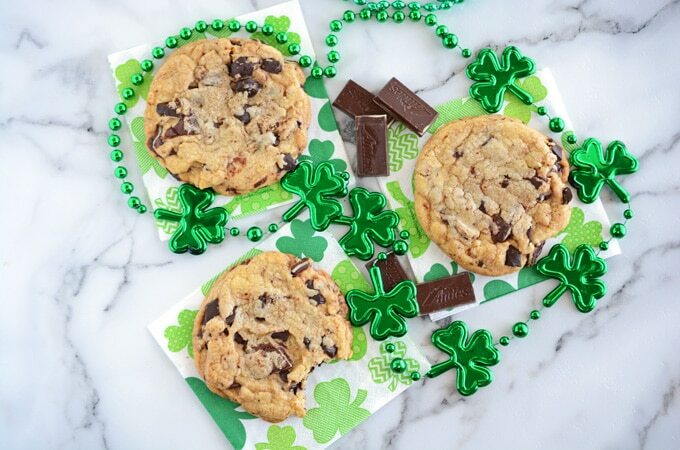 Not when you bring a plate full of these Andes Mint Chocolate Chip Cookies to your office this Thursday for St. Patrick’s Day! You’ll be “that guy”, the guy that satisfies everyone’s sweet tooth. 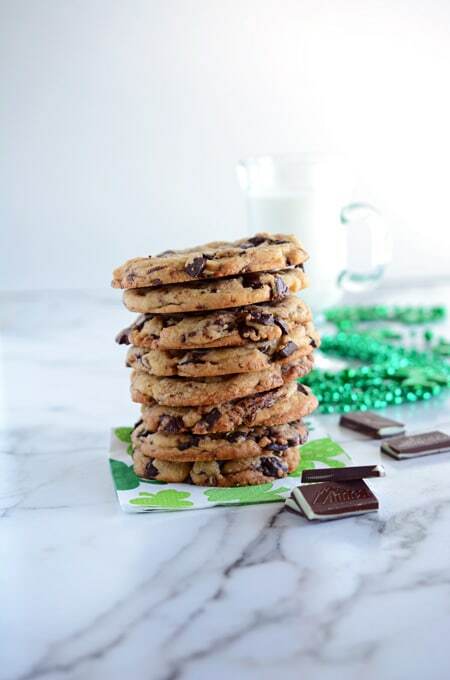 The clever guy that incorporates an all-time favorite; Andes Mints and marries it with another all-time favorite, the chocolate chip cookie. Really, you could do no wrong. So have no fear of those pinchers this year. 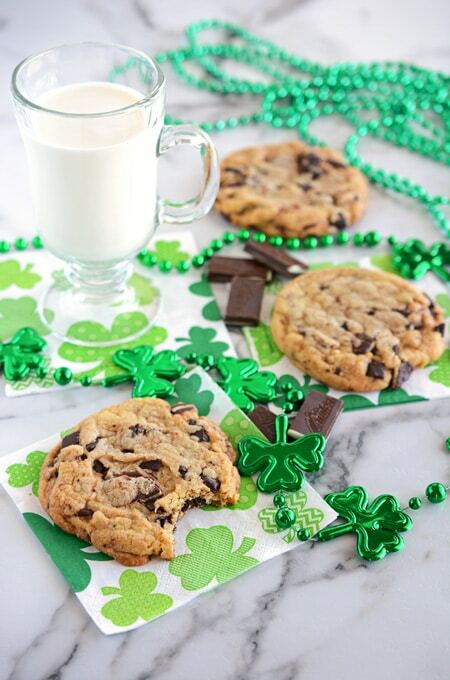 You may not be wearing green, but you’re bringing Andes Mint Chocolate Chip Cookies, and everyone loves that guy. Preheat oven to 325 degrees. Line a baking sheet with parchment paper or a silicone mat. Sift together flour, baking soda and salt; set aside. In a large bowl, combine melted butter, brown sugar and granulated sugar and beat on medium speed until blended. Beat in extracts, eggs and egg yolks until light and creamy. Mix in the dry ingredients until blended. Stir in the chocolate chunks and Andes Mints by hand using a wooden spoon until well blended. Place batter in the refrigerator for 10 to 15 minutes to chill the dough. I find this helps keep the cookies from spreading and makes the cookie dough easier to handle. Drop ¼ cup cookie dough on prepared baking sheet. Cookies should be place about 3 inches apart. Bake for 15 to 17 minutes, or until the edges are lightly toasted, rotating half way through baking. Cool on the baking sheet for 2 minutes to set cookies and then remove cookies and set aside to cool. Repeat with remaining cookie dough. Enjoy.